1. If the first three of English alphabet are reversed and so on the last two letters are reversed, then which letter will be 19th letter to the right of 17th letter to the left of 5th letter from the right? 2. How many meaningful English words can be formed with the letters in MASTE using each letter only once in each word? Here four meaningful words are from given words or combination from different letter. 3. What will be the angle between the hour and minute hands at 10 hours 20 minutes? According to the rules and concept of watch. 4. If 15th of a month is Wednesday, then what day will be on 12th of that month? 5. Which number lies opposite to 2? 6. Fill in the blanks? 7. Fill the missing number. 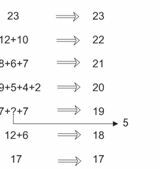 This k pattern is follow the rule of addition of all the given number is each line. 8. A, B, C, D and E has different weight. D has more weight than only A and C has less weight than B and E. Who is the heaviest in all? According to condition given in the question D & A is are in lower position. C is upper to D and B/E is on 4th or 5th position but in the top position its not clear. 9. P, Q, R, S and T has different height. Q is smaller than only T and S is smaller than P and Q. Who is smallest in height? According to the given conditions of questions. 12. How many females are there who are American but not computer professionals? 14. How many male computer professionals are there who are Asians? 15. How many American females are computer professionals in the given diagram? 1) If the first three of English alphabet are reversed and so on the last two letters are reversed, then which letter will be 19th letter to the right of 17th letter to the left of 5th letter from the right? 2) How many meaningful English words can be formed with the letters in MASTE using each letter only once in each word? 3) What will be the angle between the hour and minute hands at 10 hours 20 minutes? 4) If 15th of a month is Wednesday, then what day will be on 12th of that month? 5) Which number lies opposite to 2? 6) Fill in the blanks? 7) Fill the missing number. 8) A, B, C, D and E has different weight. D has more weight than only A and C has less weight than B and E. Who is the heaviest in all? 9) P, Q, R, S and T has different height. Q is smaller than only T and S is smaller than P and Q. Who is smallest in height? 12) How many females are there who are American but not computer professionals? 14) How many male computer professionals are there who are Asians? 15) How many American females are computer professionals in the given diagram?